You are a hundred miles high. All that your enemies place in your way. You devour and become stronger. Those that try to hurt you, will turn silent and will bow down. When you see this one in the horror section of your VOD offer, I can already warn you. This is not a horror in the strict sense of the word. It’s not a creepy or eerie film packed with demonic forces or bloody scenes where a crazy psychotic diligently swings around with a razor-sharp machete. The horror takes place in the psyche of Wyatt (MacLeod Andrews). One day he just stands on the sidewalk near Christian’s (Evan Dumochel) apartment. As we learn later they used to be best friends when they were young and hung out together a lot, spending their time playing all sorts of childish games like throwing rolled up pantyhose’s at each other for instance. Both are having a difficult time because of a breakup. However, Christian tries to put his life back on the right track by listening to motivational tapes, fitness intensely and trying to seduce his boss Mara (Margaret Ying Drake). In contrast Wyatt finds himself in a self-destructive spiral of insanity and disillusionment. He’s convinced that humanity is slowly being eliminated by creepy aliens or monsters and gradually taking over people’s identity. Well to be honest, it’s all a bit vague and it all seems rather absurd. At the beginning of the movie you can already enjoy such an absurd moment when the two friends go out one night and end up at the emergency of the local hospital with a friend of Mara. I honestly admit it. I’ve watched this scene with them in the waiting room several times. Not because of the importance of this fragment, but because it looked so hilarious. Then again, it’s the only funny moment throughout the movie. For the rest we’re only witnessing how worrying Wyatt’s situation evolves and the fact that Christian could become a victim of Wyatt’s paranoia without realizing it. Or Wyatt is right and part of the world has transformed into murderous demons. Are those observations and mysterious phone calls real? Or do they only exist in Wyatt’s deranged fantasies? Once again, don’t expect an answer to. You’ll still be groping in the dark when the movie finishes. 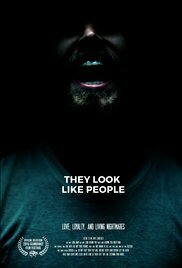 “They look like people” is certainly not interesting because of some visual feats(these are missing completely), but because of the insane and threatening atmosphere. The interaction between the two protagonists is sublimely developed. The relationship between Christian and Wyatt evolves from reasonable distant and strange, to a newfound trust. The moment one asks the other to shave his back, you may well assume that they aren’t complete strangers to each other. And although Christian instinctively feels something’s wrong, the actual denouement is a strong example of faith. This movie certainly won’t be appreciated by many and it won’t be a commercial high-flyer. But that’s mostly the case with an indie. Limited resources but extremely high creativity and a quirky character. Maybe I was initially a little disappointed because it’s more a psychological drama than a vicious horror. But ultimately it was still pretty intriguing enough. The image of a person who suffers from a psychological disorder was effectively portrayed. Now I can imagine a bit how a schizophrenic person experiences everyday life. You like a dark, pretty vague but very meticulously put together low-budget film? Then you definitely need to give “They look like people” a chance …. I, too, thought this was quite the engaging effort. Surprisingly so, actually. And, hey, just curious-I got like TWENTY Google+ notices of your film review postings in my email box today……..so where is it ya been there, lad? LOL!!! really happy i reached task darkness you. You’re excellent!